Mojave, Sonoran and Chihuahuan deserts of southern California and northern Baja, southern Nevada and through southern Arizona to New Mexico. Desert roadsides, slopes and mesas below 3,000 feet. Pale blue, 1/2-inch long blue to lilac flowers bloom on slender, erect stems January through May . The upper petal (banner) has a yellow spot which changes to reddish after pollination. The two bottom petals (keel) are short, and wide; they are hairy on the bottom edge and curve upward to a slender tip. When ripe, seed pods explode, scattering their seed to the wind. Like all members of the Pea Family (Fabaceae), Lupines have distinctive flowers with one petal on top and two on the bottom. This annual herb has dark green, palmately compound leaves with 5 to 9 leaflets arranged like the spokes of a wheel; they grow 1 1/2 inches long and 1/8 inch wide. In years of abundant rainfall, Desert Lupine will carpet the floors of the Sonoran Desert in southern California and Arizona. In years when rainfall is sparse, this blue-flowered lupine can still be found in abundance along desert roadsides. 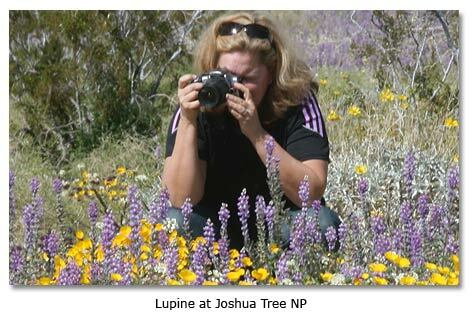 There about 70 species of Lupine in California while 23 species occur in Arizona. The range of the Arizona Lupine (Lupinus arizonicus) overlaps with Desert Lupine but can occur at slightly higher elevations. The leaves of Arizona Lupine are bright green, and its flowers are somewhat shorter with a more purple-pinkish color. Desert Lupine, often called Coulter's Lupine, is a favorite among bees. It relies on up to 10 species, including bumblebees and honey bees, to pollinate its flowers.